Is anyone else excited that Futurama is back? 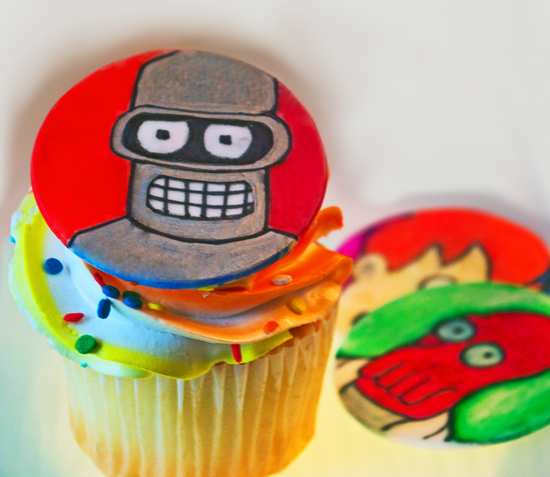 I AM– hence the effort I put into making these Futurama theme cupcakes. For these toppers I used Wilton Edible Writers on hard fondant disks. The cool thing about edible writers is that you can use them to doodle, and they are safe to eat. Personally, I’m not a big fan of fondant, but they make for a perfect canvas. Instead of using fondant to fully cover your cupcakes, you can make disks to top your cupcakes. -Roll out fondant to 1/4″ thick, and cut out desired shape using cookie cutter. Allow to dry on a parchment paper-lined cookie sheet for 4-5 hours. I’m going to make it a little easier for you to try this at home… I’m giving away 5 packs of Wilton Edible Writers to 5 lucky readers. - FIVE winners will be chosen at random, and announced on Monday night. (p.s) Wilton isn’t sponsoring this post, I just think their product is pretty cool. i would draw you a new logo as a birthday present with said writers! that and caricatures of the group. I would give these to my kids and let them color sugar cookie! I'm trying to teach myself how make, and decorate fancy fondant cakes/cuppycakes….Maybe they would help! I would create a cupcake display for my mom's 42 birthday and draw different things she has done this year onto fondant! I would decorate some sugar cookies for my bf's upcoming birthday! I would draw Looney Tunes characters for cupcakes for my brother's birthday. They'd be a smash hit! I'd doodle various rock band logos for my boyfriend as a treat before he goes away for a month. I would write equations on cupcakes for my boyfriend. Yeah, he's a nerd. I'd let my son draw whatever he wants. He's 5 – so usually comes up with some fun things. I would use to decorate holiday cookies…. Grandparents Day…. Halloween… Thanksgiving….Christmas…. New Years… etc… and lots of little holidays in between the big ones. I would draw a bison! I would try to draw something recognizable. It would be great to draw on fondant in such vibrant colours. I would let my imagination go wild. I would draw school supplies on cookies for my fellow teachers! I would doodle the Family Guy characters and give them to my coworkers, since we all seem to like to quote Family Guy when we're bored at work! I would use these to decorate some cookies for a friend who did a good deed this week. I would probably doodle some Pocoyo characters for my toddler. He is in love with Pato. I also might scribble on my husband while he naps on the couch. Just sayin'. I would doodle a big thank you if I won! i would definitely decorate cookies! with dorky science things! i'm too messy to work with icing… those cupcakes look ridiculously awesome! my best friend would pay millions for them! Red and white toadstools…I have been obssessed with woodland creatures and mushrooms since seeing a real toadstools in Germany! I want to dip marshmallows in yellow frosting and draw spongebob on them for my nephew's party. The first thing I think of is the cupcakes and toppers I'll be making for upcoming birthdays – Settlers of Catan for a friend, fruit flies for one of my research lab members, australian-themed for one of my best friends – and these would be quite helpful. i am still learning to make cakes and use fondant so i would totally use them to draw details on baked goodies! The first thing I would use them for is to draw Toy Stoy charcters on cupcakes for my son! I would so try to draw Furturerma! You did a awesome job! I would love to use them to decorate sugar cookies! I would draw little dancing girls for my friends for the cupcakes I bake for their burlesque shows. Nothing like a dancing girl and sugar to bring on a pleasant mood. Oh and it's babmigalore@gmail.com sorry I forgot it. Two of my favorite things. I've done them in embroidery, I'd like to do them on cupcakes! Do the Bender! Yeah, baby! My husband and I are super psyched the show is back on. As for me I'd doodle up a few comic book style "Pows" and "Zams!" on some brightly colored backgrounds. The scapegoated person been specifically known as “the identified patient. re a girls weekend with a spa, or whenever you say you can. ‘ Call – If you’re all-around your Ex’ family, asking relating to family members is yet another method to reestablish connection with your Ex. moment by two portions of so-called rum, supplied to him at one of these simple shanties. the man immediately underwent treatment by specialists for his throat trouble. all year round, even in flood-time, so when the water was clear fish may be seen taking the bait with a depth of 10 feet. my biscuit cutter and cut out the heads. I was very pleased to discover this page. I want to to thank you for your time due to this fantastic read!! Look for sites with a large number of Mario games and especially a game called ‘Infinite Mario’as this is my personal favorite. hours before you all take a seat for the bday meal. and playing video games as part of their everyday life. instead as a leisure game for wealthy ladies with no understanding of. US first, but either way, there are many regional restrictions for gaming online. have become quite a craze among people of all ages. find and tag each of the players. including tablets and it does not require tto have Root or Jailbreak. Two wonderful dudes, Darrell and Bill, are among the top hackers about the globe. Develop you wil like crack resource out for you.Thank you for understanding and it will work! Globally, 67% of portable large spenders are male together with the majority between 21-35 yrs old. The filmmakers make the most of the characters and settings without ever trying to teach us a lesson or make us cry.